When the textile conservator of the Fries Museum in The Netherlands, Gieneke Arnolli, invited me earlier this year to visit their archives, I just couldn’t wait for my next trip to my home country. 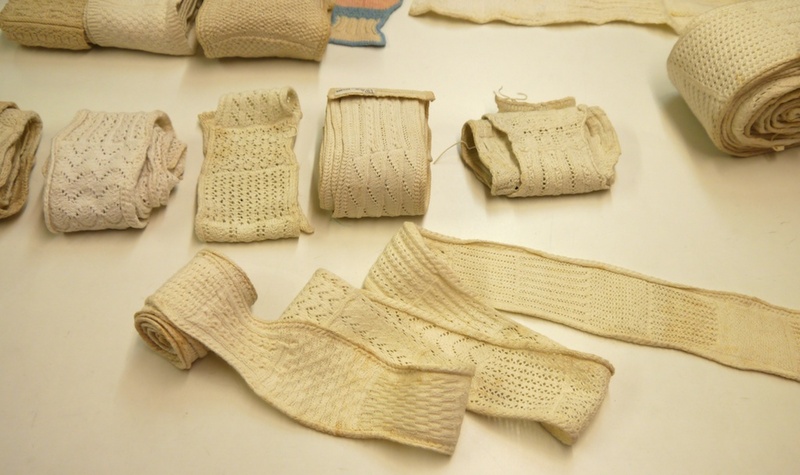 Her description of their textile collection made my mouth water and my fingers itch, as it contained many knitted items and darning samplers; what’s more, there were even knitted darning samplers! Last week I finally got to visit Gieneke. There was so much to see and talk about with her, that I don’t quite know where to start with sharing it all, so today I’ll give you a general impression, and will write some more about particularly interesting items in two follow-up posts. These gloves are very special in many ways, as they were the reason Gieneke and I got in touch to start with. They arrived in the Fries Museum collection by way of a collector of curiosities. He probably bought them in some antique shop, and that’s all we know about them for certain. 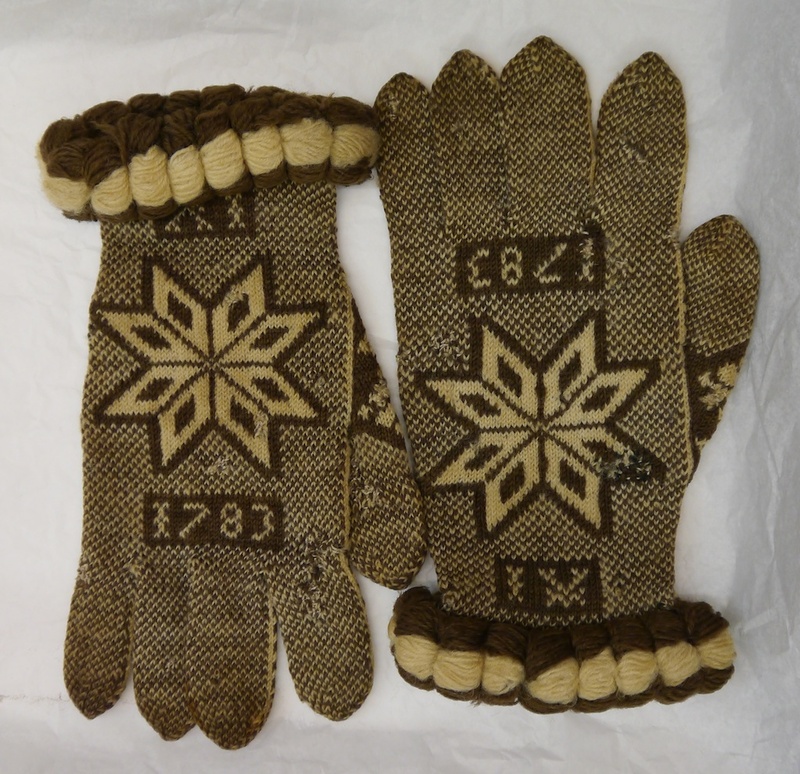 They have elements of a number of knitting traditions from a number of countries: the seeded stitch pattern and initials are like gloves from Sanquhar and The Dales from the UK, the Nordic star or rose could be from a Scandinavian country, the shape of the letter A is particular to Friesland and Scotland, and the embroidered loops are reminiscent of the elaborate decoration found in textiles from the Baltic states. 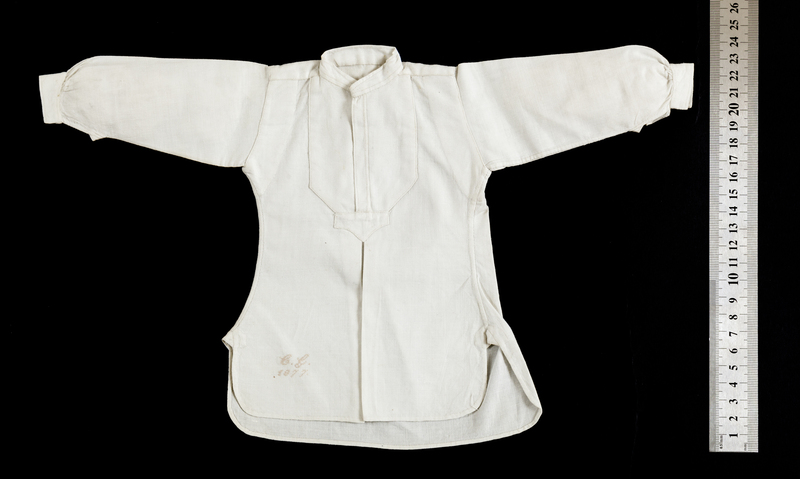 The Fries Museum has a large collection of traditional Frisian folk costumes. One part of the women’s outfit was this skullcap, which would be worn over a bronze, silver, or gold head ornament, which sometimes covered almost the whole skull. Traditionally they were made from bobbin lace, procured from Belgium or France. At the beginning of the 20th century it became difficult to source the amounts of lace needed for the floddermuts (the ruffled neck part can contain well over a meter of lace) and knitted lace was a good substitute. In other words, there was no knitting tradition for these mutsen in Friesland, and they were made to emulate the bobbin lace. Many of them show patterns I recognise from Shetland lace knitting. 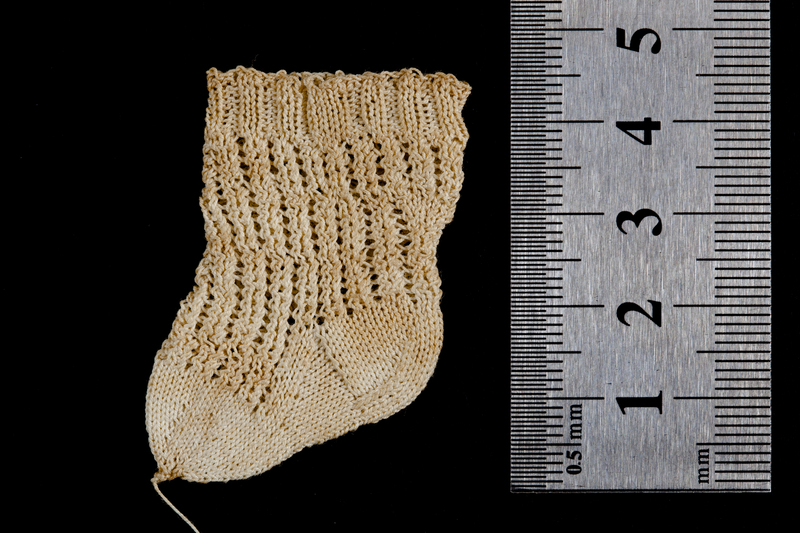 This floddermuts was knitted with sewing cotton, using knitting needles probably smaller than 1mm! I particularly like the little bobbles in the diamonds on the back of this floddermuts. They are so round and full, they look like the muts is studded with pearls. In order to keep warm during the cold winter nights, everybody wore night caps. 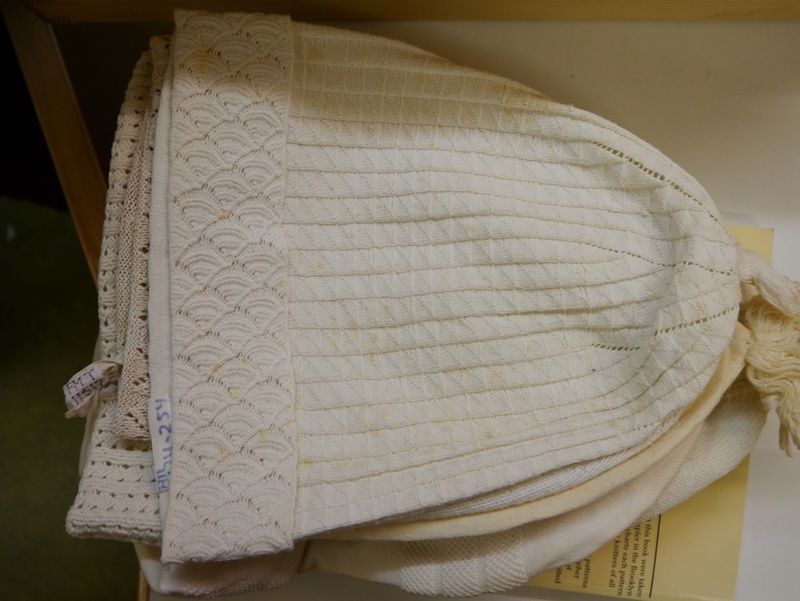 Traditionally, girls wore night caps made from woven fabric with delicate lace trimmings, and boys wore knitted night caps. Here’s a selection of them, mostly knitted by hand, but the Fries Museum also has some crocheted and machine-knitted examples. The Fries Museum also has a large collection of dolls. Most of the dolls were not to play with, but for girls to learn to knit and sew. Most of them have all the garments that make up a typical outfit of the period the doll is from. It allowed girls to practise the various needlecrafts and the construction of garments, from socks, underwear, petticoats, to shirts, jackets and coats. 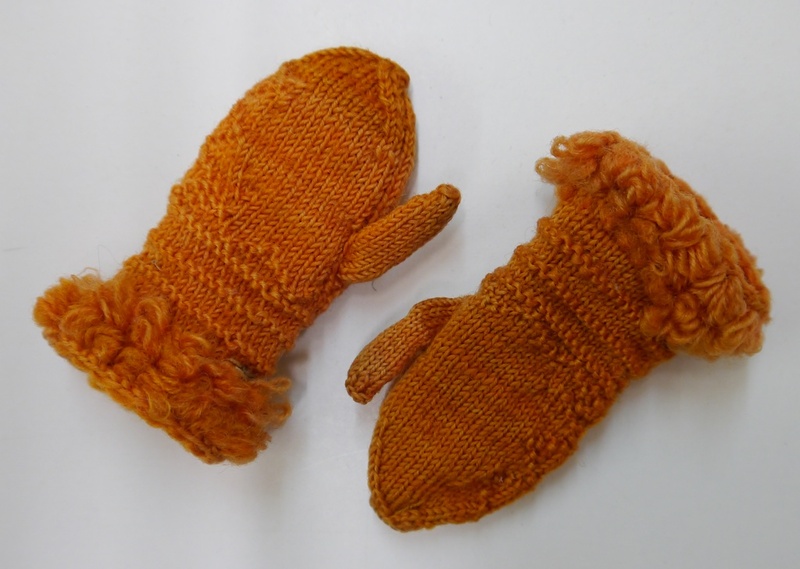 I loved these miniature mittens for a doll, in a jolly orange colour, and the loopy trimming at the edge. There were drawers full of knitting samplers. 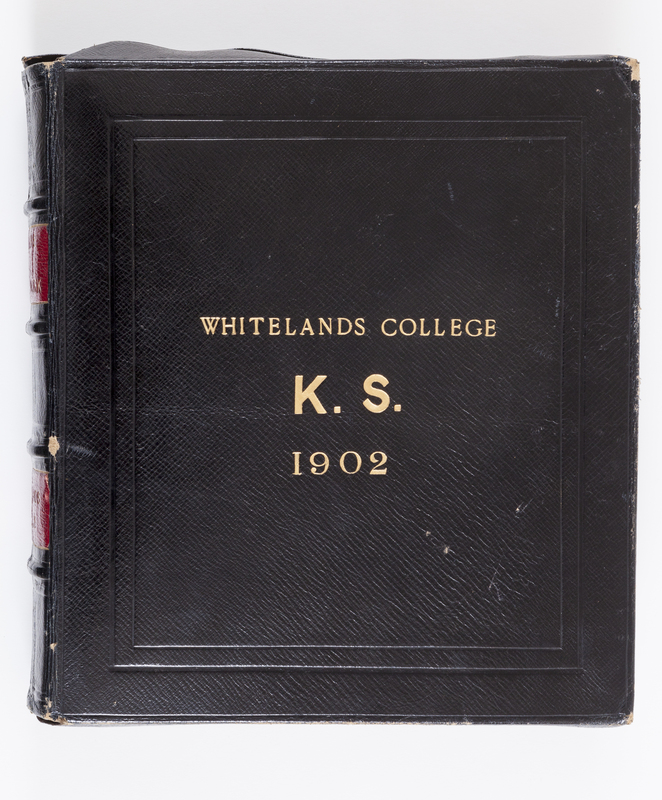 They were used to learn stitches, and as an aide-memoire to remember their construction – in a way they’re personal stitch dictionaries. Susanna Lewis’s Lace Knitting Workshop on a knitting sampler held in an American museum was part of the inspiration for my Curiosity Cabinet of Knitting Stitches, so it was very nice to see some of these objects for real. Gieneke is particularly fond of the knitted mitaines. The fashion of the time (we’re talking very roughly 1750-1850 – I’m not a fashion historian and I didn’t manage to take notes of every single item I saw) dictated dresses with sleeves to the elbow, so to keep your arms and hands warm in a house without central heating, women usually wore mitaines, wrist warmers, or muffs. The pair on the right is particularly beautiful, with the pointed shape to cover the back of the hand, and this shaping is repeated on the thumbs. 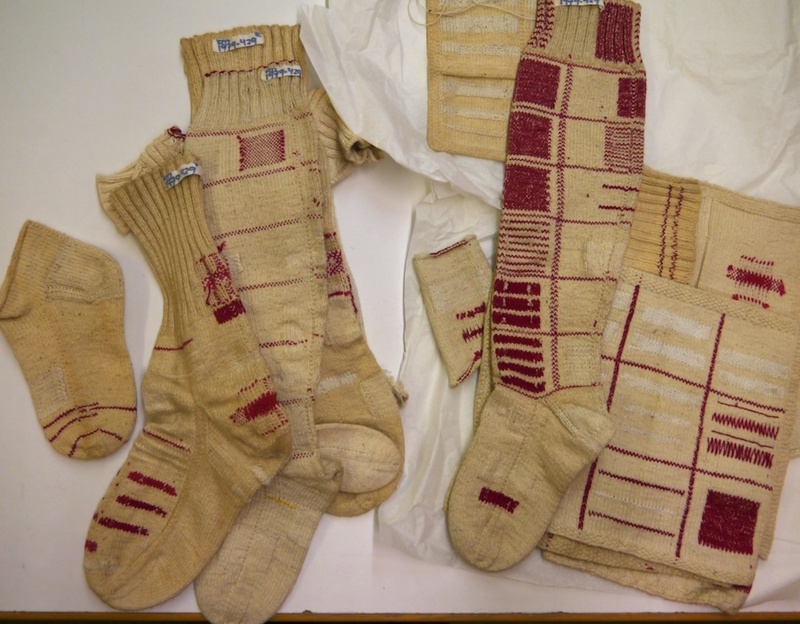 When Gieneke opened the drawers with the darning samplers I got very excited! So far I’ve only seen these on-line and in books. It was a very special moment to be able to examine these up close, and see the back as well as the front. 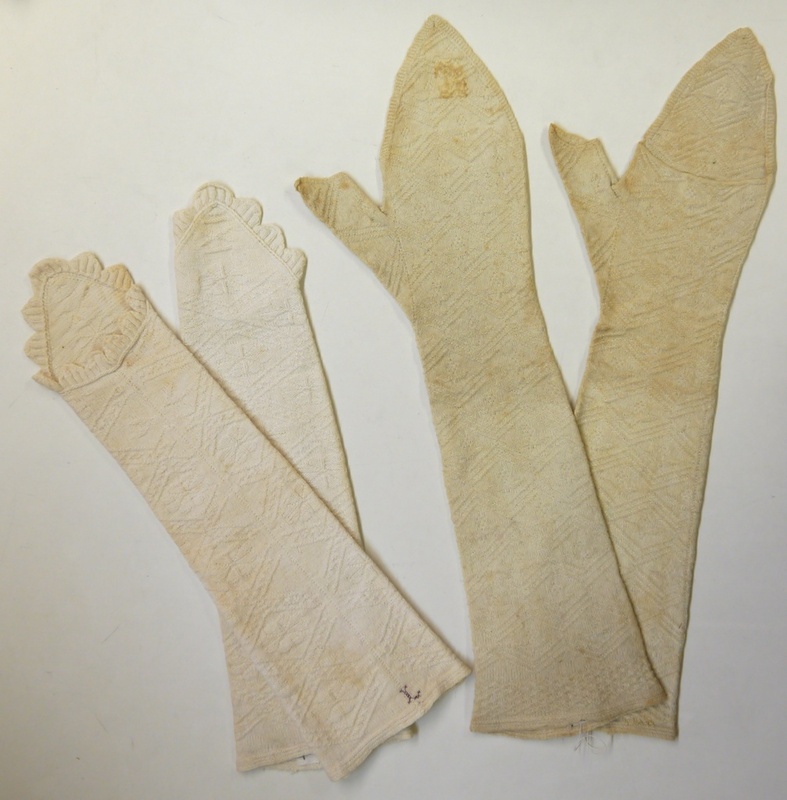 The darning samplers were part of most girls education. They taught them how to mend household linen in a large variety of weaves. 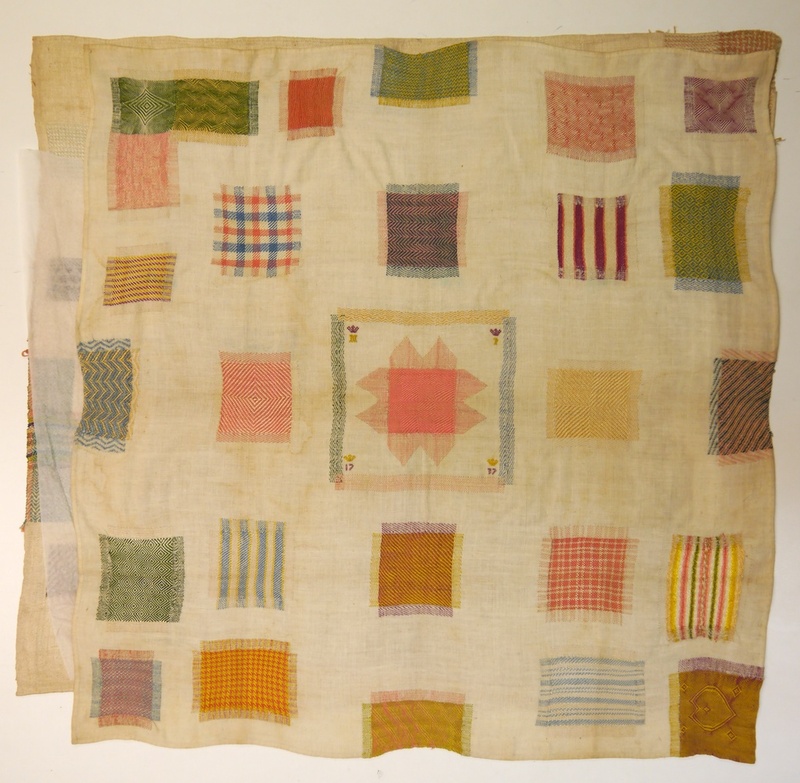 These were executed in coloured threads (often silk or cotton) on a fine linen fabric. The colours would help see the beginning darner what was going on, and get a better understanding of the construction of each darn. Ultimately, the aim would be for these darns to be made in the same colour thread as the item to be fixed, so the repair would be nigh on invisible. 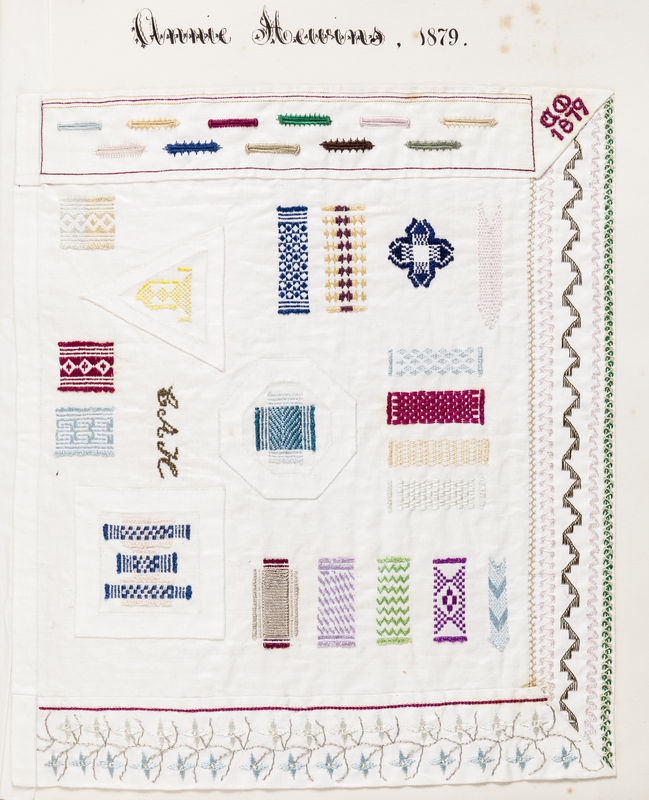 However, I find these samplers in their many colours very beautiful, and I can only imagine the patience required, and undoubtedly the frustration felt by the girls who had to make these samplers. 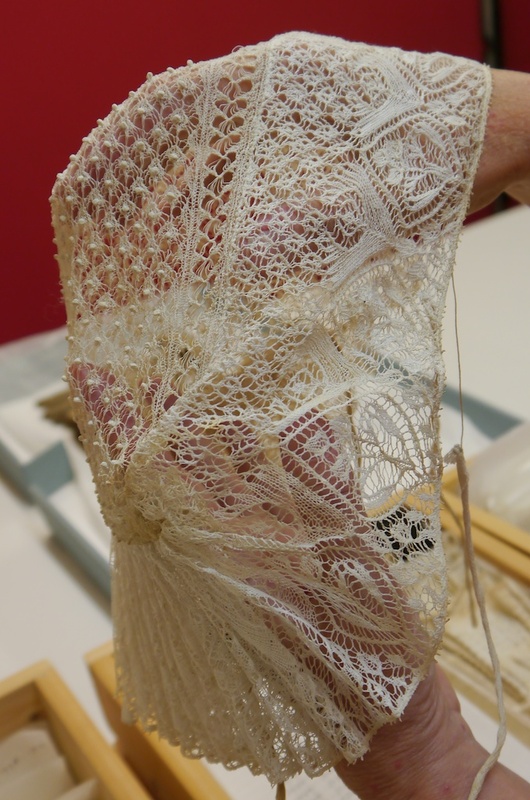 Interestingly, Gieneke pointed out that although most girls were taught these skills, leading to beautiful samplers, most real-life darning on the clothes in the collection was never executed with the same attention to detail. Clearly these women had better things to do than spend hours and hours darning a hole on a skirt. Can it get any better? Knitted darning samplers! 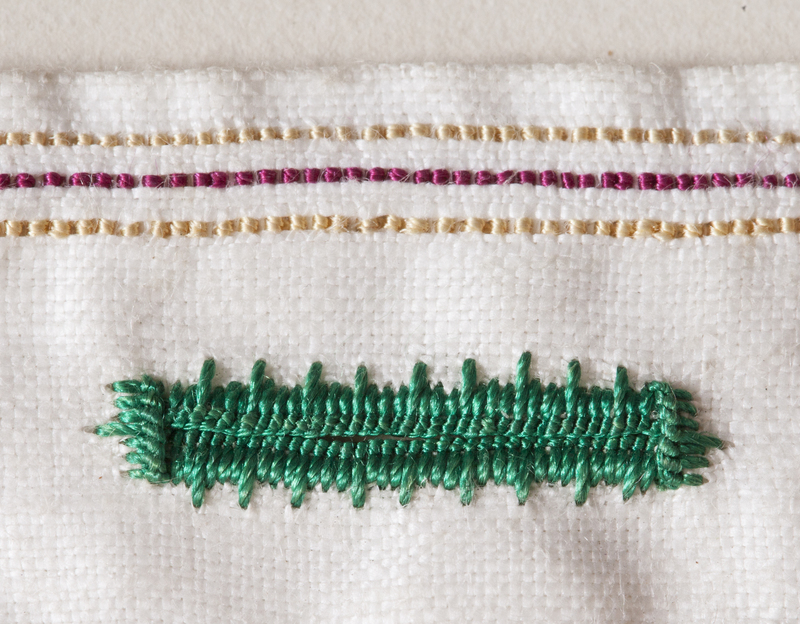 And after the drawers of woven darning samplers, Gieneke opened the drawers with the knitted darning samplers! What I really like about these, is that many of them were done on actual socks and stockings. Undoubtedly the girls first had to knit the stockings, then divide them into squares with the red thread; each square would then give them an area to practice a particular darning technique. 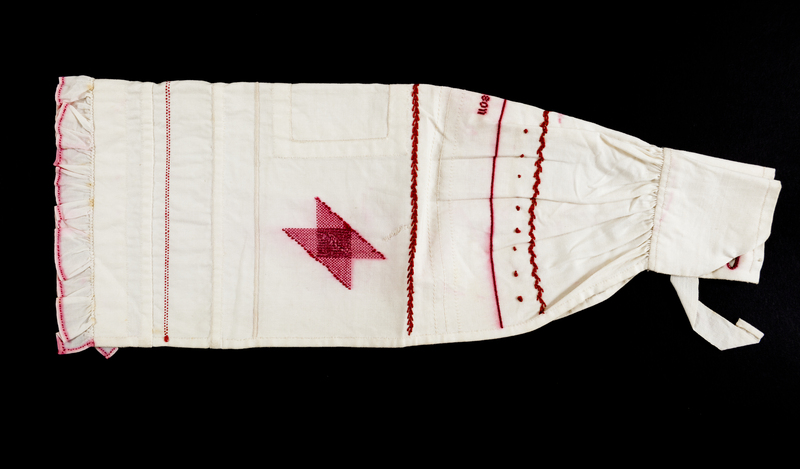 It’s worth zooming in on this image (you can do this by clicking on it) as you will see that every sampler here not only has darns and repairs in red thread, but also in white or cream, rendering them almost invisible. 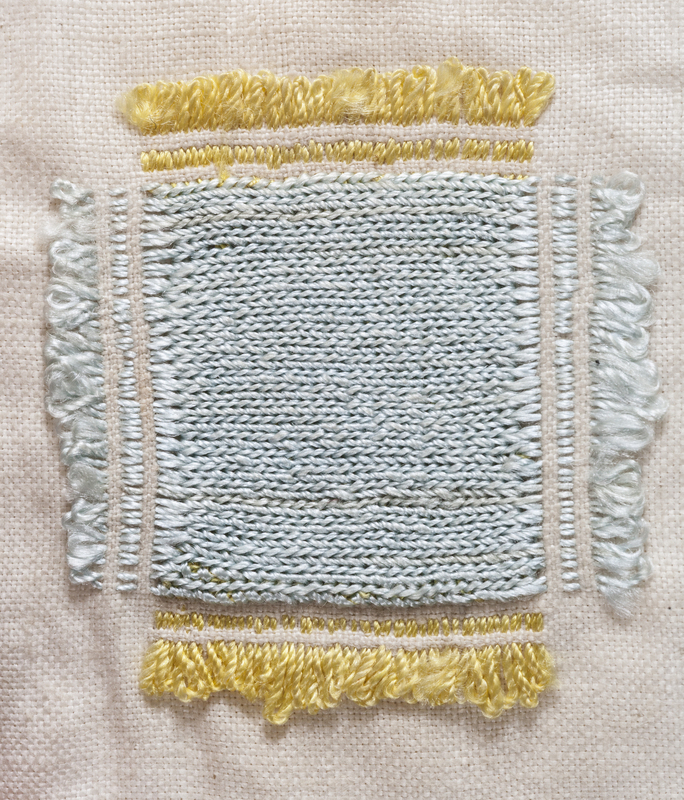 There are some interesting things to observe about the darning samplers, so keep an eye out for my follow-up blog posts, where I will discuss the woven and knitted darning samplers in a bit more detail. With many thanks to the Fries Museum and Gieneke Arnolli for allowing me to take pictures and giving me permission to share them on my blog.